It's fair to say the Academy Awards have rowed back on just about every change they've tried to make to the Oscars ceremony this year. They wanted, for example, to announce some winners in the commercial breaks to save time. They wanted to introduce a new popular film category to recognise more mainstream movies. Put together with Kendrick Lamar pulling out of performing and the lack of a host this year, it's understandable that the planning of this year's event has been described as chaotic. One Hollywood veteran, however, tells BBC News that things should be kept in perspective ahead of Sunday's ceremony. "Chaos? It's just an awards show! Goodness me. 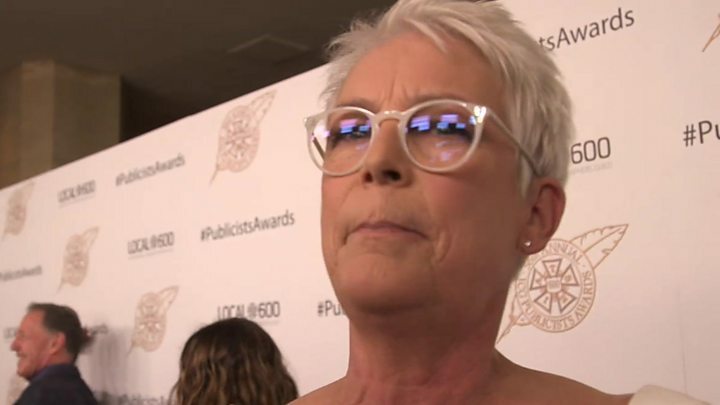 Take it down a level," says Jamie Lee Curtis at the ICG Publicists Awards in Los Angeles. "You know what, those were just some missteps, everybody's trying to figure out how to make these things shorter, a little more easy on the eyes. "Obviously they made a couple of missteps but they've made some huge strides in diversity and inclusivity, so you have to remember it's a moving machine, it's not something rigid. "And they're trying some new things. It didn't go well, they're pulling it back, and they'll figure it out. But it's an awards show, let's put it into that category." Curtis was being honoured with a lifetime achievement award at the publicists' luncheon, which is organised annually by the International Cinematographers Guild. The actress, who starred in A Fish Called Wanda and several Halloween movies, used her speech at the event to highlight the important role played by both press and publicists in the entertainment industry. "I believe in the freedom of the press. I believe that you have the right to ask me whatever question you want to ask me... And it is a dance that we have been doing for a very long time," she told the audience. "We figure it out, we dance together and it is a mutually beneficial dance because this is show business - this is show-off business. "[Some stars] don't talk to the press until they have a movie coming out... they are fraudulent. The truth is this is the game - this is how it's played and I am proud to play it with you." Curtis was one of several stars at the event keen to champion this often-overlooked area of the industry. "You wouldn't know much about a film or the actors without a publicist," explains Sheryl Main, the co-chair of the awards. "A great publicity team can make a difference, especially on a smaller film that doesn't have a big budget, maybe doesn't have a huge studio behind it." Crazy Rich Asians is one recent film which benefitted hugely from a strong PR campaign, its director Jon M Chu acknowledges. "We had a lot of trouble before the movie came out when testing the movie," he tells BBC News. "A lot of people didn't know the book, some people who did know the book were sceptical of Hollywood. Other people thought the title wasn't for them. "So our publicity team, our marketing team, everyone on the Warner Bros side, had to really get in the dirt and had to show the world what we were and what we stood for." The team promoting the movie ensured its groundbreaking status was championed. Crazy Rich Asians was the first Hollywood film in 25 years to feature an all-Asian principal cast, a fact many news outlets started to pick up on as the campaign progressed. "One by one, it was a masterclass for me to witness how it became a must-see movie," says Chu, adding he is now working on a sequel. "We are in the very beginning stages still. Throwing around a lot of ideas, a lot of good ideas, bad ideas, so we're trying to weed it out to find the best one, we won't make it unless it's great." One of the film's stars, Michelle Yeoh, describes the publicity campaign as "one of the crucial, most important things" in the success of the film. "We're not under the Marvel banner, with the huge name, we didn't have a lot of big stars," she tells BBC News. "So we pushed it in such a way that it captured the imagination of the audiences and it drew them and made them curious about the lifestyle, the culture, the songs, the food, the glamour." But despite its box office success, Crazy Rich Asians failed to pick up any nominations at this year's Oscars. "I guess there's always hope, you'd love that your film be nominated. Of course there's the disappointment when it's not, but when you think about it, everything really went against our movie," Yeoh says. "Because it's a romantic comedy, it's an all-Asian cast, that's unheard of for 25 years, so can you imagine, for it to achieve the success that it already has done, is such a reward for us. "It would have been the cherry on the cake if we'd had a nomination, but our publicity team had to work through so many hurdles just to get us where we are." It could have been a very different story if the Academy had pressed ahead with the popular film category - which almost certainly would've been one in which Crazy Rich Asians was recognised. But in spite of that, Chu thinks it was the right choice for the Academy to drop it. "I'm a big fan of the classic Academy Award categories," he says. "So I wasn't a huge fan of doing a popular film category, even if it meant maybe we'd get a better chance. I honestly didn't think we had any chance to be in the awards season, so this has all been very amazing to go through and live through." Chu recalled the most bizarre moment of the awards season so far - which occurred at a gents toilets urinal last month. "I went to the bathroom at the Golden Globes, and on my left was Alfonso Cuaron, and on my right was Jordan Peele, and I was like 'Oh, this is Hollywood now', and it was an amazing feeling. It was great to see how the face of Hollywood had changed."